Hawaiian numerology is more of a spiritual study rather than an empirical science. It represents a system of knowledge based on the fundamental precept that all of creation originated from a divine energy source. It embraces the premise that all existence is a manifestation of the mana (esoteric energy) of the divine Creator and that everything in this universe has a spiritual and physical relationship to each other. 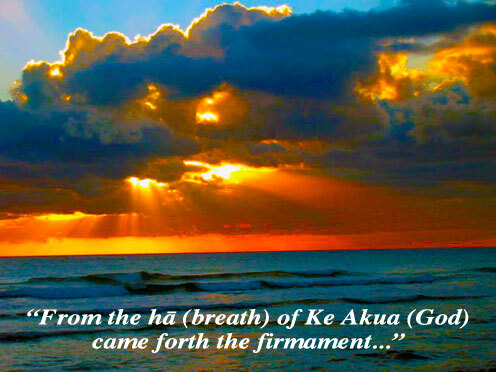 This concept is reflected in the traditional Hawaiian expression: Hā Ke Akua i ka lewalani, ka hā o kona waha which translates, “From the hā (breath) of Ke Akua (God) came forth the firmament, the hā exhaled from his mouth.” The ancient Hawaiians perceived the hā as the sacred life force and identified it with the very essence of life itself. They believed that at the precise moment we are born and inhale our first breath, we also become one with the hā (breath) of Ke Akua. Thus in the days of old Hawai`i, a person’s birthday was celebrated with the important rite of passage that marked an individual’s initial connection to the spiritual realm of the Gods. Spiritually, the early Hawaiians traditionally offered their hā after ending their pule (prayers) and the kahuna priests performed hā rituals such as the kapu `awa (ceremonial drink offering to the gods), waiha (water consecration rites), ho`opomaika`i (blessings) and when preparing for ka wanana, (prognosticating). The Hawaiian school of numerology teaches that the set of cosmological conditions and vibrations of the earth’s field of energy at the time of our birth determines our general character traits, personal attributes and also to some extent, influences the actions and reactions that we encounter within our lifetime. Since the ancient Hawaiians were governed by a lunar calendar, the specific lunar month and day on which a birth occurred were used by the kahuna as traditional hō`ailona hānau (birth sign) indicators for predicting the future characteristics of an individual.